Our Gangtok Pelling Kalimpong Tour is specially formulated for those who seek nature, adventure and history all in one tour in India. This 8-day itinerary will take you through Gangtok, Pelling, Kalimpong and Darjeeling. The tour starts from Gangtok, visiting all the beautiful places. The state capital has so much to offer, that you’ll fall in love with yourself and nature all over again. Our exclusive Gangtok Pelling Kalimpong Tour itinerary has been designed to fulfill your requirements and provide you with the most amazing tour with leisurely services. Our endeavour would be to include all the attractions of Gangtok that reflect the city. 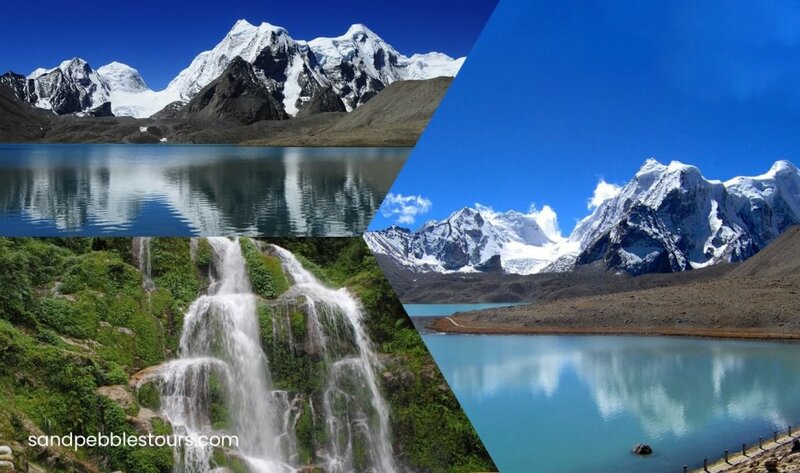 We will also ensure that the neighbouring locales like Tsangu Lake and Nathu Pass are also in the itinerary as they make important parts of attractions in Gangtok. Where the lake is home to Brahminy Ducks and shelter to migratory birds, the Pass is the border between India and China. The Gangtok Pelling Kalimpong Tour allows you to open the treasure trove of North East and get a good look at the finest gems like Kalimpong and Gangtok tucked neatly in the lap of the beautiful state of Sikkim. You shall also get the chance to enjoy the scrumptious delicacies that are a blend of East and North East food. Take a deep breath of clean air and marvel at the natural beauty that you would encounter during the Gangtok Pelling Kalimpong Tour. The itinerary will give you a brief insight into the places you will be visiting. On arrival at NJP Railway Station / IXB Bagdogra Airport, (413 Ft / 126 Mts) you will be pick up & transfer to Gangtok (5412 Ft / 1650 Mts, 130 Kms / 04 to 05 Hrs). Check-in and overnight at Hotel. Morning Go for a half day (04 hrs) sightseeing covering Jhakri Water Falls along with Do-rul Chhorten, Research Institute of Tibetology (Closed on Sunday), Directorate of Handicraft & Handloom (Closed on Sunday) and Flower Show. Afternoon transfer to Pelling (5500 Ft / 1675 Mts, 116 Kms / 05 to 06 Hrs). Check-in and Overnight at Hotel. After breakfast we drive to Yuksom (5840 Ft / 1780 Mts, 35 Kms / 02 Hrs) on way panoramic sightseeing of Darap Village, Rimbi Waterfall & Hydro Project, Khecheopalri Lake (6000 Ft / 1829 Mts) it is one of the sacred Buddhist mountain lakes and it is believed that whatever is wished in front of the lake comes true. A myth is that when a leaf falls on the placid clear water surface, it is picked by a bird & Kanchanjunga Waterfall. A further drive takes you to Yuksom (the meeting place of three monks) – the first capital of Sikkim. This was the place where the first Chogyal (a ruling dynasty in Sikkim) was crowned. Evening back to Pelling and Overnight at Hotel. Transfer for Kalimpong (4091 Ft / 1247 Mts, 115 Kms / 05 to 06 Hrs). Overnight at Hotel. Today after Breakfast visit Dello hills, Dr. Graham’s Home, Flower Nurseries, Jang-Dong- Palriffo Brang and Durbin Dara Hills. Transfer to Darjeeling (6710 Ft / 2046 Mts, 70 Kms / 03 to 04 Hrs). Overnight at Hotel. Early morning tour to Tiger Hills (8482 Ft / 2586 Mts at around 4 AM) to view sunrise over Kanchendzonga Peak (subject to clear weather). On way back visit Ghoom Monastery, Batasia Loop. After breakfast go for a half-day sight seeing of Japanese Temple, Peace pagoda, Padmaja Naidu Himalayan Zoological Park & Himalayan Mountaineering Institute (Closed on Thursday), Darjeeling Ropeway Ride (Ticket cost not included & will be approx INR 180.00 per person) Tenzing & Gombu Rock, Tibetan Refugee Self-Help Center (Closed on Sunday) & panoramic view of Tea Estate. Overnight at Hotel. Transfer to NJP Railway Station / (IXB) Bagdogra Airport, (413 Ft / 126 Mts, 100 Kms / 03 to 04 Hrs) for onward connection.